Future of Sourcing Digital is excited to continue our popular series titled “Women in Global Sourcing.” This series strives to highlight, celebrate and acknowledge women who are pioneers and leaders in the industry and who have been influential in moving the industry forward. 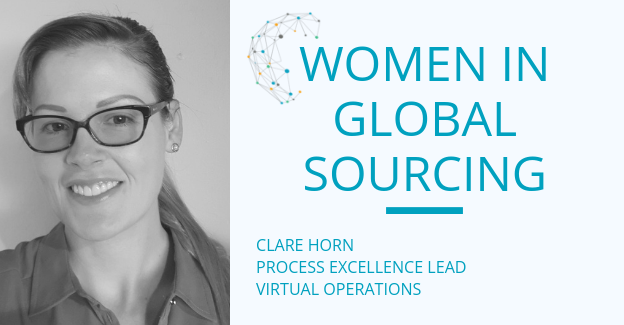 It is our pleasure to feature Clare Horn this week, of Virtual Operations. Clare has been with Virtual Operations since 2016. She has a background in business & process transformation, primarily Lean & Six Sigma consulting and has worked in a varied range of client industry sectors including FMCG, Retail, Energy & Utilities, Civil Engineering and Defence. During her time with Virtual Operations, she played a leading role in selecting automation-driven optimisation & transformation project opportunities, as well as defining strategic approaches. I have been part of the Virtual Operations team as Process Excellence Lead since 2016, prior to which my career had followed an admittedly unusual path from its beginnings in applied physics, via operational excellence consulting. During my early career, I began to seek a more commercially rewarding role in which I could apply my strong analytics background. I gained accreditations in program and project management, as well as Lean, Six Sigma and other supporting methodologies, and made the switch. Over the next eight years, I had the opportunity to build valuable experience delivering a number of high-profile projects, across a range of client sectors. I was becoming increasingly aware of the rapidly growing automation industry and its potential to deliver business benefits, and some very encouraging, collaborative discussions with Nick Andrews (Virtual Operations Executive Chairman) led to an invitation to join the company. Ultimately, the decision was driven by a mutual desire to combine incredibly powerful, complementary tool sets to deliver genuinely transformational results. Absolutely – with the condition that I would have probably made the switch into business transformation, and ultimately automation, earlier if I could have! For me personally, the most impactful change in thinking was the recognition – in which Virtual Operations has undoubtedly led the way – that a successful strategic automation approach and best-in-class, industry leading specialists, require precisely this holistic combination of skills and experience. This represents a step change from the concept of solely technical teams focusing on tactical project delivery and has been shown to deliver return on investment (ROI) on a different level from the latter in isolation. What’s the biggest challenge facing your industry today - and how do you plan to solve it? Perhaps the biggest challenge is the hype which, paradoxically, is damaging the industry. The providers repeatedly state that it’s a self-service play with no real technical or process excellence skills required. Nothing could be further from the truth. To go beyond automating the low hanging fruit, which is very sparse in the vast majority of organisations, requires deep knowledge of a huge array of technologies, highly experienced process excellence skills as well as detailed client process information. The combination of client and specialist knowledge is crucial. The market buyer, in general, doesn’t see this. Being able to successfully transfer my analytical and critical appraisal skills, in order to perform my current role in an industry which is, in my view, the most exciting and rewarding environment to work in right now. I am proud to have been a part of the Virtual Operations delivery team on a number of successful projects, since transformation is so important to me, I would view a particularly significant achievement as successful completion of an advisory project with one of our largest clients, identifying six times ROI benefits compared to their original business targets. What’s your biggest (as yet) unfulfilled ambition - and what are you doing to achieve it? To help establish our company as the undisputed industry leader in end-to-end specialist automation (we’re getting there), and to help an increasing number of clients realize their ambitions to become fully digital enterprises. In order to do this, we recognize that we need to help businesses navigate the potentially daunting territory in between taking their first steps on the automation journey, and the end goal. We are pushing this forward by developing a unique suite of products and services, by engaging with industry thought leaders and knowledge sharing groups such as SIG, and by delivering innovative solutions in collaboration with our partners and clients, in response to specific industry needs. While I’m not a subject matter expert in the field of sourcing, outsourcing and procurement, I would offer some generic advice based on my own career experience: don’t be afraid to challenge norms or take a change in direction – if you possess unique, valuable transferable skills not commonly utilized within your functional discipline, you can bring game-changing potential and true differentiating value to your role, as I hope I have demonstrated! Clare has been with Virtual Operations since 2016. She has a background in business & process transformation, primarily Lean & Six Sigma consulting and has worked in a varied range of client industry sectors including FMCG, Retail, Energy & Utilities, Civil Engineering and Defence. During her time with Virtual Operations, she played a leading role in selecting automation-driven optimisation & transformation project opportunities, as well as defining strategic approaches. Clare has been responsible for leading the Virtual Operations automation programme in the global CSO function of one of thier largest clients since 2017, in which they have identified over 30% cost savings aligned to multiple benefit drivers. She is also actively involved in partner & vendor liaison and has ownership for several of Virtual Operations innovative product & service offerings.